The pacification Sejm in Warsaw. 1735 r.
The Sejm was convened on 27 July 1735. The pre-sejm sejmiks were held in August and September 1735. The Sejm began its proceedings on 27 September 1735. The Speaker of the Chamber of Deputies was elected Antoni Poniński, who was the Marshal of the Warsaw Confederation. 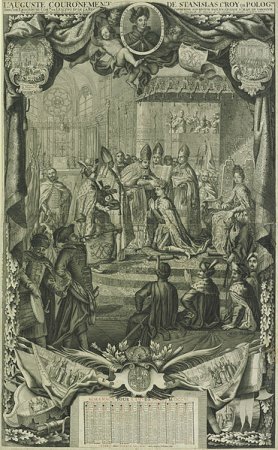 The Sejm was broken up by supporters of King Stanisław Leszczyński, who contradicted the idea of the pacification parliament after the war for the Polish crown in 1734-1735, and concluded its proceedings on November 8, 1735. See: W. Konopczyński, Dzieje Polski nowożytnej [The History of Modern Poland], v. 2, Warsawa 1986; H. Olszewski, Sejm Rzeczypospolitej epoki oligarchii (1652-1763). Prawo-praktyka-teoria-programy [The Sejm of the Commonwealth of the age of oligarchy (1652-1763). Law-practice-program-theory], Poznań 1966; J. Michalski, Sejm w czasach saskich [The Sejm in the Saxon Times], in: Historia sejmu polskiego [The History of the Polish Sejm], v. 1, Warsaw 1984, edited by J. Michalski, p. 300-349.